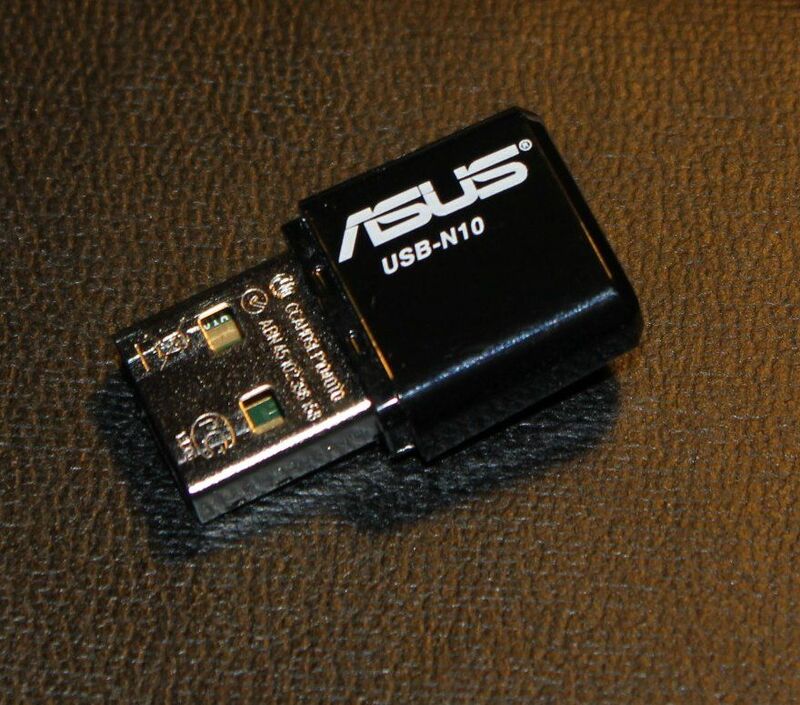 Asus USB-N10 known also as ASUS EZ N is a WiFi b/g/n USB adapter. It's sized between common mini adapters and long classical ones. Slightly longer housing was used to put bigger antenna than that found in mini adapters. How this Realtek based WiFi adapter works under Linux? Lets find out. The WiFi adapter is based on Realtk RTL8188S chipset and uses r8712u Kernel driver that is available from some time. Asus gives Kernel 2.6 as the minimal supported version, however it's good to have the latest Kernel for Your distribution. There are few or more reviews of this card from other users. It worked out of the box and it even works on Raspberry Pi with up-to-date Raspbian distribution (or other with recent Kernel). r8712u: module is from the staging directory, the quality is unknown, you have been warned. usb 2-1.1: r8712u: Loading firmware from "rtlwifi/rtl8712u.bin"
Aside of the Kernel driver a firmware file is also loaded - /lib/firmware/rtlwifi/rtl8712u.bin. This will should be present in nearly any modern distribution (except those minimalistic or non-desktop oriented). If the firmware file is missing then dmesg logs will tell you that and the card won't work. When connecting this (or other) adapter to a laptop which already has the internal WiFi adapter working it's good to disconnect from access point (if used). You can also disable the internal WiFi adapter with a switch on the laptop housing if it's available. The not-smallest-possible antenna did gave quite stable performance during in-house test usage. The reported signal of few access points was slightly better on my Asus N53S than the internal Atheros card got (but only slightly). Card owner is using it currently (few weeks at least at the moment of writing) and has no issues under Ubuntu 13.04. I tested it on two laptops and one PC under Ubuntu 13.04 (and partially also on 12.10) and it did work out of the box (with a "small" problem described below). This card works, it's quite good performer, it's quite small although not mini-sized (do you need such size?). It's good for Raspberry and probably for other ARM-based mini computers. It's also good if your laptop or PC needs a working WiFi adapter. It's rather not the weapon of choice when you have a weak signal or some walls the signal has problem penetrating (for that you need something with bigger external antenna or also better router, signal repeaters). The card wasn't working and few times when plugging in/out it crashed the whole system. When reporting the problem on Ubuntu launchpad I was pointed to packaged upstream Kernels and I tested one of RC versions of 3.9 Kernel. This version solved the problem. On Asus N53S the WiFi adapter did not work on older Kernels (3.8 in Raring Ringtail and older in Ubuntu 12.10). It did work under 3.9. What's funny is that the newer Asus (and another Samsung) ultrabook had no problems with this card on 3.8 Kernel. I'm assuming it's a rare problem with the motherboard or USB or motherboard controller + that WiFi chipset/driver. If the problem was more common it would showed up in someones review. When the WiFi was working the driver pointed out that it's still something new and... you have been warned. Either so the WiFi dongle worked as designed under Linux. Low power Bay Trail, Celeron or AMD APU Athlons, Semprons are storming the market allowing users to create quiet or even fanless PCs for multimedia or daily home use. Most of motherboards offer PCIe connect, but as a limited to x4 (AMD) or x1 (Intel) version. We can connect a USB3 or Firewire 800 PCIe controller to it, but can we use an external graphics card to improve the gaming performance of such low power quiet PCs? Can PCIe x1 2.0 can provide enough bandwidth for the GPU to perform at a good or acceptable level? Or maybe can it give some extra features like CUDA cores or multiple display support that can be used to some specific tasks? In this article I'll test and compare three basic and cheap graphics cards I got from local bidding site quite cheap. Will Celeron J1900 be able to run games faster and what will be the difference between x1 and x16 on a classical motherboard? Graphics card resource usage monitoring is quite rare. Most desktop widgets and applications will just show CPU and RAM usage. There are however tools that can be used to monitor AMD, NVIDIA and Intel graphics cards under Linux. It can be used for fancy graphics or to locate the weakest chain in the GPU rendering process when trying to determine why some tasks are so slow. After building a PC with Celeron J1900 it's time to run some benchmarks. Aside of other Intel CPUs there are AMD competitors like new Sempron and Athlon 25W CPUs with good graphics or the old E-350 still available on the market. Most of them are similarly priced. To run benchmarks I've used phoronix benchmark tool, as well some bootchart for system boot up time charts and power usage monitor to check how much power the PC is taking. Angry Birds Go! is a new game made by Rovio with a Angry Birds theme. This time we will be racing to get to the final prize. Our team will consist of birds as well as of piggies. On the other side the game faces some hardware/software problems. Many good-brand devices is marked as incompatible. Secondly many players are reporting problems with the game - crashes, blank screens and so on. So we have a good game and surprising problems.